Lighter than an anorexic helium balloon and about as benign as a mine dump sized lung full of asbestos dust, my new agave blank has left the runaway train of my paranoid brain, seesawing on the edge of a cliff. 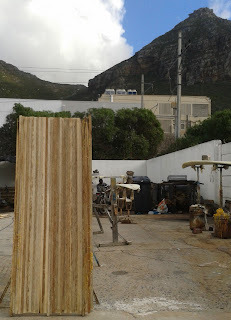 On one hand Agave is the perfect local surfboard building material, as light as Balsa with beautiful colouring and freely available everywhere from Bellville to Ballitto. I’ve driven through parts of the Karoo, the old tequila plantations, where the gargantuan flowering stems of these Mexican immigrants stretch off ad infinitum, looking like nothing less than a B-movie sized army of asparagus, freshly escaped from the evil Monsanto’s lab and on the march, ready to take over the world and make all of our pee smell funny. By harvesting these flowering stems before the seed sets (as you must to obtain rot free, A grade wood) you slow the invaders progress, a happy side effect. But like every too-good-to-be-true story since Moses split the red sea, working with Agave has its drawbacks. The sawdust from the wood is a major irritant, on your skin it’s about as soothing as napalm infused aftersun lotion and in your lungs, well, I can feel my lungs composing their Dear John letter as I write. So it’s with shopping trolleys full of procrastination that I approach my new paipo project – Dr. Evil, the planing hell cometh.